In Greek households, New Year’s Day is Saint Basil’s day and the name day for any one with the name Basil, (Vassilis). Name days are celebrated in stead of birthdays in Greece. 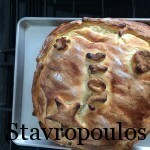 Traditionally, Greeks eat a bread called the Vasilopita on January 1. Inside the bread, the baker places a coin wrapped in aluminum foil prior to baking. When the bread is sliced each piece is designated for a family member, whoever finds the coin in their slice is considered to have luck for the new year. My godmother made the bread when I was growing up. It was sweet, perfectly round and beautifully decorated. 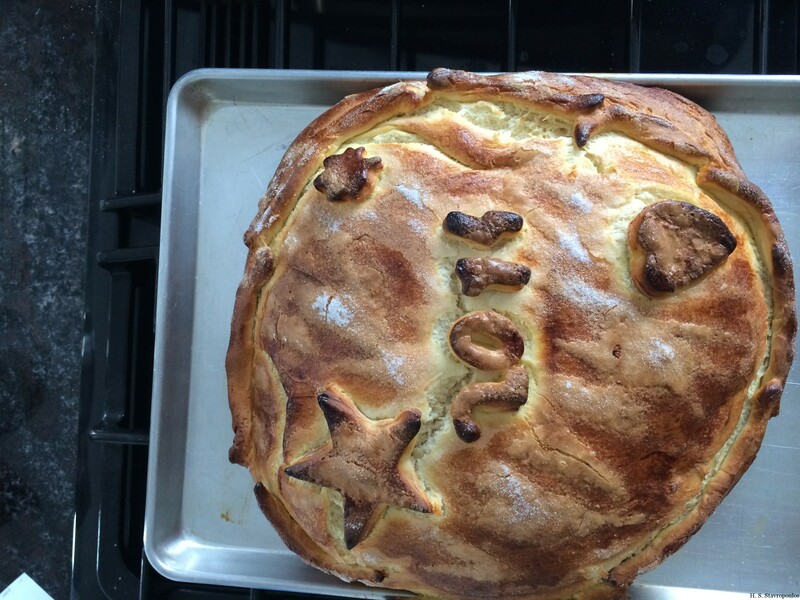 In her memory, I made the vasilopita on New Year’s Day for my family. Not as perfect as hers or as pretty, still it reminds me of the happy times I shared with my godmother throughout my childhood. She was an incredible cook and bon vivant. And throughout my childhood, I received the coin until I was old enough to be told that my godmother made sure that I received the slice with the coin every year. Traditions after all are about memories. Old and new, passing the torch from one generation to another. Each taking the tradition and adding new memories before passing it on to the next generation. Personally, I believe that the best traditions accompany food — good Greek food — with family and good friends around a table. Growing up I spent New Year’s Eve at my godmother’s house. Every one waited until midnight and then a chorus of Xponia Polla (Many Years) rang throughout the house. The next day we ate together – a meal around two in the afternoon in keeping with Greek ways. After the end of the meal, we cut the vasilopita. And I got the coin. Today my family cut the vasilopita I made. I can happily report that it tasted as sweet as ever. I didn’t get the coin, the youngest member of my family did, in keeping with my godmother’s tradition. Happy New Year!! Xronia Polla! !